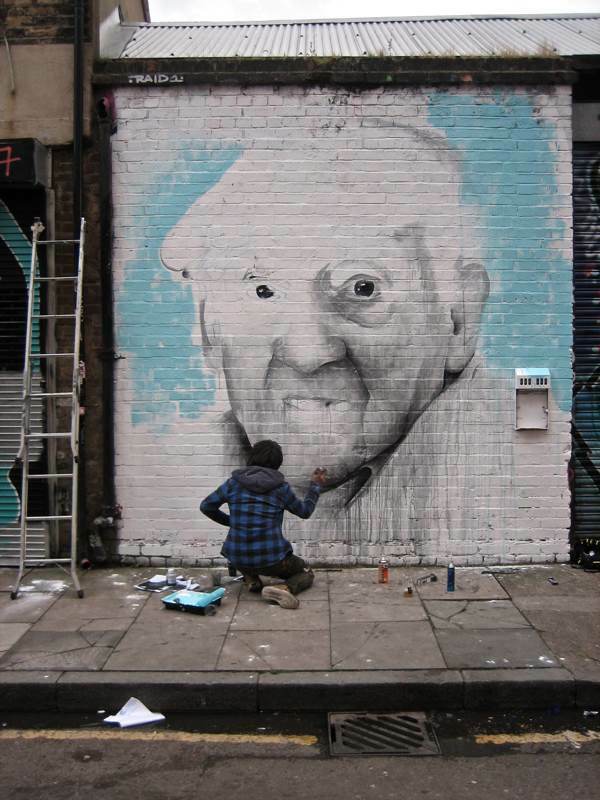 As a tribute to East End legend Charlie Burns who died yesterday, aged ninety-six, I am republishing my interview with the grand old man of Brick Lane from May 2010. You may not have seen Charlie Burns, the oldest man on Brick Lane, but I can guarantee that he has seen you. 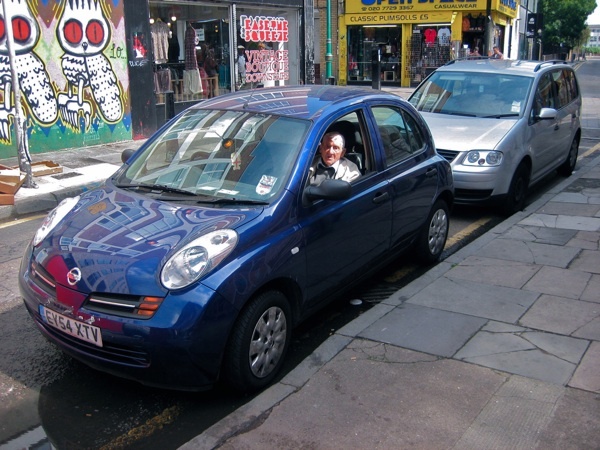 Seven days a week, Charlie, who is ninety-four years old, sits in the passenger seat of a car in Bacon St for half of each day, watching people come and go in Brick Lane. The windscreen is a frame through which Charlie observes the world with undying fascination and it offers a deep perspective upon time and memory, in which the past and present mingle to create a compelling vision that is his alone. For a couple of hours yesterday, I sat in the front seat beside Charlie, following the line of his gaze and, with the benefit of a few explanations, I was able to share some fleeting glimpses of his world. The car, which belongs to Charlie’s daughter Carol, is always parked a few yards into Bacon St, outside the family business, C.E. Burns & Sons, where they deal in second hand furniture and paper goods. Carol runs this from a garden shed constructed inside the warehouse, and lined with a rich collage of family photographs, while Charlie presides upon the passage of custom from the curbside. Many passersby do not even the notice the man in the anonymous car who sits impassive like Old Father Time, taking it all in. Yet to those who live and work in these streets, Charlie is a figure who commands the utmost respect and, as I sat with Charlie, our conversation was constantly punctuated by a stream of affectionate greetings from those that pay due reverence to the king of Bacon St, the man who has been there since 1915. The major landmark upon the landscape of Charlie’s vision is a new white building on the section of Bacon St across the other side of Brick Lane. But Charlie does not see what stands there today, he sees the building which stood there before, where he grew up with his brothers Alfie, Harry and Teddy, and his sister, Marie – and where the whole family worked together in the waste paper merchants’ business started by Charlie’s grandfather John in 1864. Once the business grew profitable, the family became involved in boxing, the sport that was the defining passion of the Burns brothers, who enjoyed a longstanding involvement with the Repton Boxing Club in Cheshire St where Tony Burns, Charlie’s nephew, is chief coach today. “Somehow or other, we got into boxing and then we were running the Bethnal Green Men’s Club and then we took a floor in a pub. We were unstoppable. We used to box the Racing Men’s Club. We used to box at Epsom with all the top jockeys. We made the Repton Boxing Club. I was president for twenty years and I took them to the top of the world. When we joined there was only one boy in the club. (He still comes over and sees me.) We built them up, my brothers, myself and friends. They all done a little bit of boxing. We had some wonderful boxers come here. They were all poor people in them days, they were only too glad to get into something. We used to take all the kids with nothing and get them boxing. They played some strokes but they never did anything bad. Everything we done was for charity. We were young people and we were business people and we had money to burn. You would think that the present day might seem disappointing by contrast with vibrant memories like these, but Charlie sits placidly in the front seat of the parked car every day, fascinated by the minutiae of the contemporary world and at home at the centre of his Bacon St universe. “This place, years ago, was one of the toughest places there was, but one of the best places to be.” he announced, and I could not tell if Charlie was talking to himself, or to me, or the windscreen, until he charged me with the rhetorical question, “Where else can you go these days?” I was stumped to give Charlie a credible reply. Instead, I peered through the windscreen at the empty street, considering everything he had said, as if in expectation that Charlie’s enraptured version of Bacon St might become available to me too. Charlie reminded me again,“We were paper merchants. We were moving forward.”, as he did several times during our conversation, recalling an emotional mantra that had become indelibly printed in his mind. It was an incontestable truth. 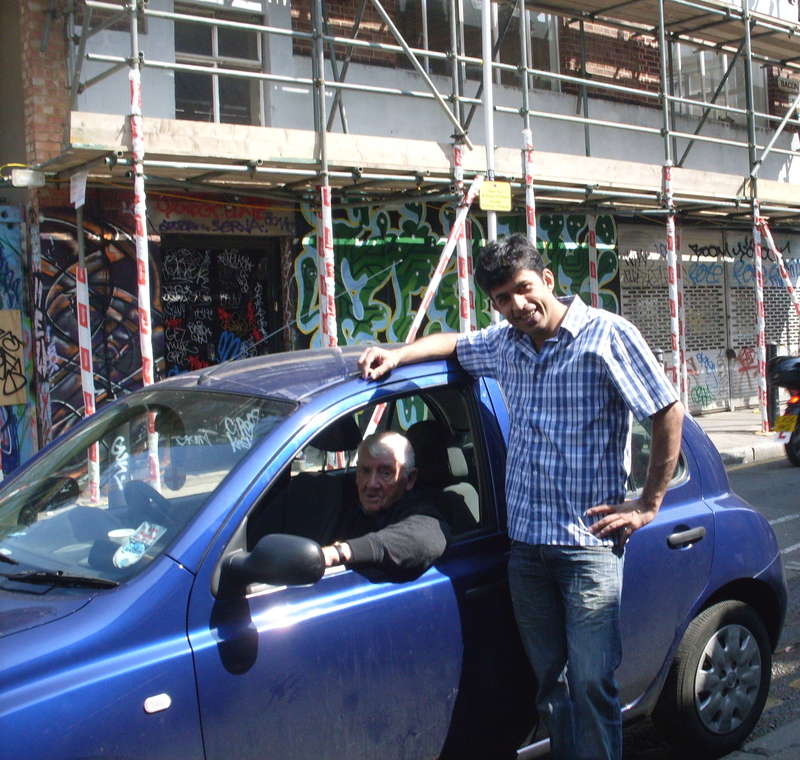 We were King Lear and his fool sitting in a car beside Brick Lane. Becoming aware of my lone reverie, Charlie turned to reassure me. “I’ll get some of the boys round for a chat and we’ll go into it in depth,” he promised, with quiet largesse, his eyes glistening and thinking back over all he had told me,”This is just a little bit for starters”. Charlie Burns in his customary location in Bacon St, August 2011. 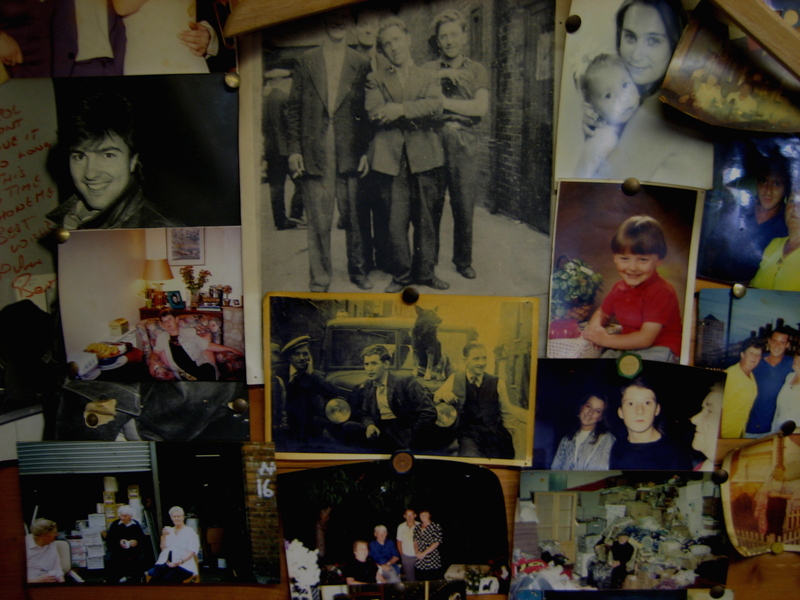 On the wall of Carol’s shed, in the yellowed photo at the centre, taken in Bacon St in 1951, you can see Charlie’s brothers Alfie and Teddy, with Charlie on the right. 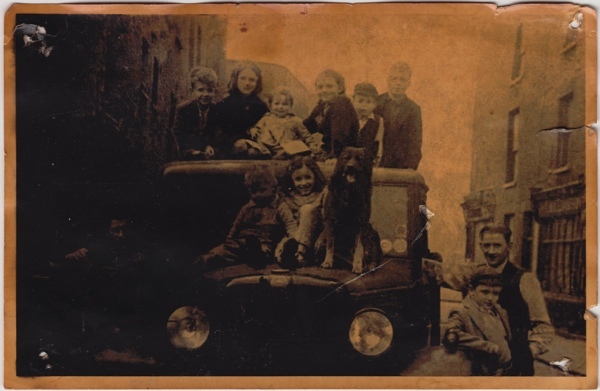 The Burns family in 1951, with Charlie again in the right. 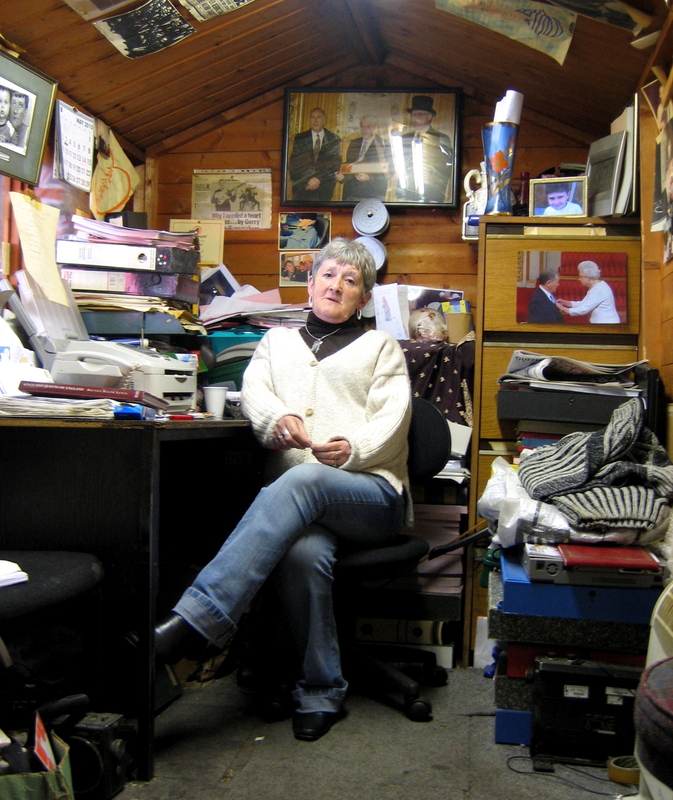 The redoubtable Carol Burns in her shed with the photo of her Uncle Tony, president of the Repton Boxing Club, being honoured by the Queen. Charlie’s good friend and neighbour Asad Khan sent in this photo of the two of them together. Painting the portrait of Charlie Burns on Bacon St last August. What a wonderful tribute to a great East Ender. And how wonderful, too, that his legacy endures in these words and images. we were paper merchants. we were moving forward. Rest in Peace grandad, A true legend. 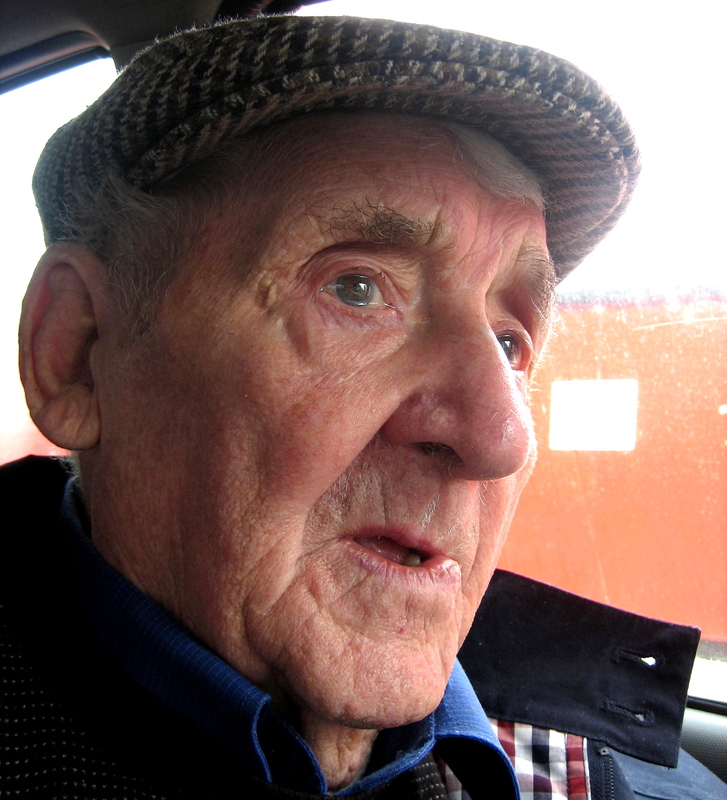 RIP Charlie Burns ‘King of Bacon Street’ Eastend Legend and Gentleman. Thank you so much for introducing us to Charlie. What a man! RIP Charlie! Lovely to see the mural of him. What a lovely tribute to an old man and his life! A lovely tribute – as was the mural. Is there any chance of getting the artist back to restore his work as other grafitti ‘artists’, with far less respect for the area, have now scrawled and sprayed their self promotions across it? It is a honour to have had this man as my uncle, my mother is his sister Marie, the youngest and last of that generation. My mother has always told me stories of their childhood, and in what high regard she had for her elder brother. The tricks he would play on her, the teasing etc, and like most children of that era, how their working lives started so young. I loved meeting him, he always had a good story to tell, and we always left with a laugh. He truly was a rare and generous and charitable man, life will never be the same down Bacon Street, an era has ended with the passing of this wonderful charecter. Old man will never forgoton, I wonder if we will not talk about him any single day. He lives in our hearts and he will stay there forever. How can we forget your prediction for our twins. I will always wonder that who told you that. I believe that you knew people deep from there souls. My children will not see the man who wished blessing for them every day, but stories that we will tell them. Who says that blood relations are the only relations. This relation of love and respect with you will never broke , we promise. Sorry to hear of the sad loss – i remember when you used to come to our house – as we lived in Bethnal Green – which you knew our father the late Freddie Read – who passed away in Sept 2010 – so Charlie R.I.P and my God be with you. A very beautiful tribute to an – obviously – very special human being! I met Charlie and family in the mid 80′s. I worked for BT in the City and Charlie did our removals. Reading this he was in his 70′s then and still actively moved stuff with his boys. I’m doing the knowledge now to be a cabbie and always past by Bacon St. I’ll be sure to stop and say hello to Charlie’s lovely mural when I do. Always remembered. Lovely memories I have . We traded on Sclater street and owned buildings in the area. From the London Trimmings Family . R.I.P.